Parker Wittenmyer of Wauseon has qualified for the Business Professionals of America National Competition. As a member of the Business Professionals of America (BPA), he traveled, with other FCCC BPA students, to Columbus in March for the 50th Annual State Leadership Conference. 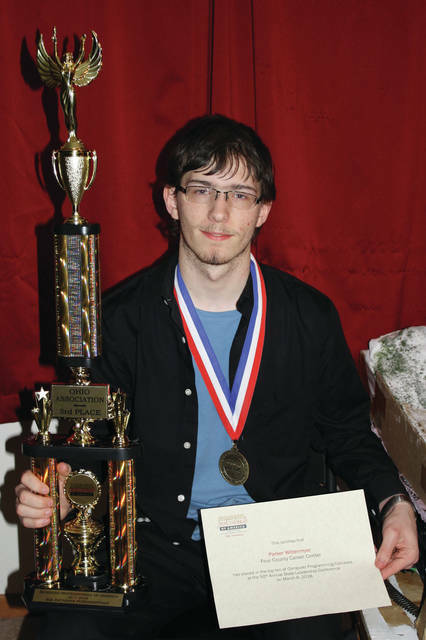 While there, Parker placed in the top 10 of Computer Programming Concepts, and he also placed third in SQL Database Fundamentals, which qualified him to go to the National Competition in Dallas, Texas May 9-13. Parker has been accepted to the University of Akron for the fall of 2018 and has been awarded the freshman Akron Guarantee Scholarship and an Underrepresented Student Scholarship, both from the University of Akron. Parker is the son of KC and Becky Wittenmyer of Wauseon. He is a senior at Four County Career Center, where his field of study is Software Development and Video Game Design and recently tried out for the varsity esports team at Akron.